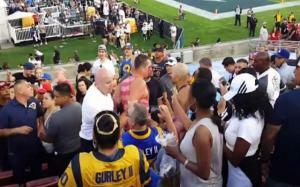 Fans fight at the Los Angeles Coliseum during a preseason game between the Chiefs and Rams. 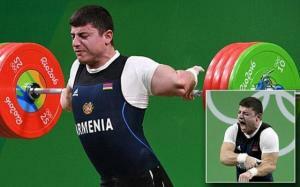 Armenian weightlifter Andranik Karapetyan crashed out of the Olympics in agony as his left elbow gave way during a lift attempt. 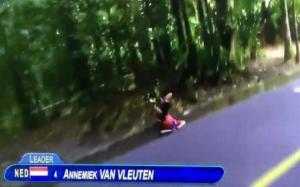 A horrifying cycle accident has left Olympic cyclist Anna van Vleuten in intensive care, with 3 spinal fractures and a concussion. scolgirl killed by elephant after it threw a rock while she posed for picture at a zoo. three people died after a man set a fire inside a spital ward in tirana, albania, on june 25.
a tiger attacks and kills a woman at a safari park in china. a man acting bizarrely on a bus is st by the cops after a split-second struggle. police in fresno have released video which sws the graphic soting of dylan noble. scol play stunt goes wrong, as students are set on fire.